Rada of the Belarusian Democratic Republic actively condemns the violence by the police of the Lukashenka regime against citizens during peaceful demonstrations on March 25, 2017. Freedom Day, March 25, is the main holiday of the Belarusian people. It is the anniversary of the beginning of the modern Belarusian statehood. On this day, Belarus has for the first time in history declared itself an independent democratic state. In the future, it will definitely be the main official holiday of Belarus. 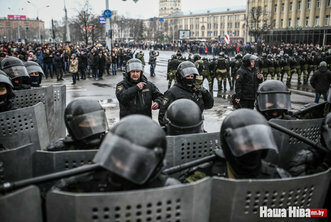 By preventing Belrusians to celebrate March 25, the dictatorial regime led by citizen Alaksandar Lukashenka, who since no later than 1999 is illegally occupying the post as President of the Republic of Belarus, has once again demonstrated its anti-Belarusian and antidemocratic nature, as well as its immediate succession with the totalitarian Soviet occupiers. The crimes committed by personally Alaksandar Lukashenka as well as by persons participating in repressions against the citizens of Belarus will in the future be given a relevant legal evaluation, as it has been done in all other countries of Eastern Europe after their liberation from the Soviet occupation or from pro-Soviet communist regimes. The BNR Rada demands an immediate release of all activists arrested on March 25 and on the days before, whose number is as high as several hundred people. The BNR Rada draws the attention of the international community to the continuing blatant violations of human rights in Belarus, the lack of any democratic progress in the country. The BNR Rada calls upon the countries of the European Union, the United States of America, Canada and all other countries of the Free World to put active political and economic pressure on the pro-Russian dictatorship in Belarus in order to ensure immediate democratic transformation and respect to human rights in Belarus.